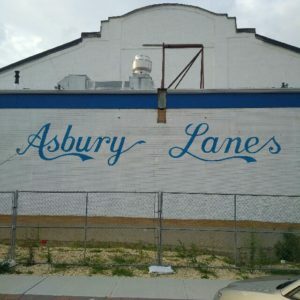 Asbury Lanes - Sauro Motel	• Sauro Motel - The Collected Writings of Bobby Sauro. After study, we drove down the Shore. Upon arrival, the cops escorted us out of Deal. It was too cold for the beach, but the guy in Asbury turned on Lane No. 1 for us. We drank pitchers and tossed bombs down a warped alley. The place was ours alone. We threw strikes and hit splits, like the guys with thick sideburns on Wide World of Sports. The lights flickered. We discovered we could hit the reset button and gain an extra frame. “There gonna shut this place down one day soon,” the manager told us. He handed us back our Lou Brock sneakers. We raised the collars on our Pony League baseball jackets and strutted into the afternoon light, fully expecting that the next place we went was gonna be better.